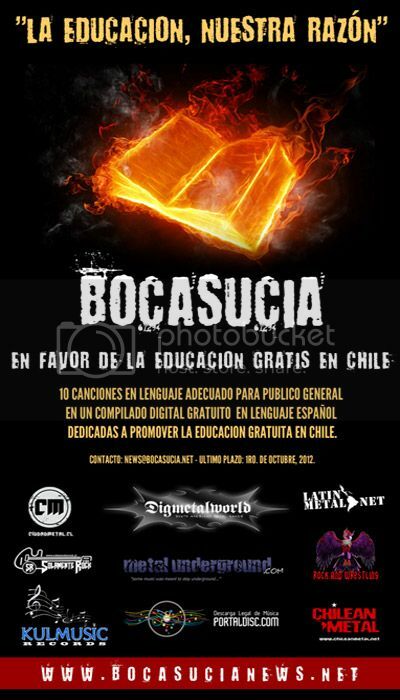 Digmetalworld, in conjunction with Portaldisc/KulMusic, has announced that a preliminary line-up of bands has been confirmed for the compilation "La Educacion, Nuestra Razon." The anthology will feature ten Chilean metal bands and veterans of the scene, each contributing a song to bring heightened awareness the the cause of nationwide free education in Chile. The concept that "La Educacion, Nuestra Razon" emphasizes is that education should be the right of the masses and not a privilege of the wealthy or private sector. With a tentative release date in early 2013, Digmetalworld has established November 2nd as the cut off date for artists wishing to submit a song. Currently, the bands Rex, Sinsilencio, Ultra Mortal, Rajavana, Krudo, Pirosaint and Ratzinger have confirmed their presence on the compilation. Ivan Vega of Ratzinger wrote the track "R3volucion" especially for the album, and even Sr. Diaz of veteran old schoolers Vastator will be backing up Pirosaint on vocals. This will be one of the first musical offerings from Pirosaint since 1997, and Sr. Diaz backing them up was opportune considering the band currently has no vocalist while they audition for the spot. Sebastian Osorio from the band Raining will even contribute guitar solos to Pirosaint's selection for the album, which will be the second time they collaborate after working together on 2010's track for the Chilean earthquake relief. Pirosaint will take a brief detour from it's thrash origins into more power, melodic turf for their track. The ten songs on the outing will be all distinct styles across the spectrum of metal, all coming together to highlight a cause that is important to them and their countrymen. Bands wanting to submit their music for consideration on the digital release "La Educacion, Nuestra Razon" can get information on submitting their music here. More information will be given as more bands confirm for the release. 0 Comments on "Chilean Compilation For Education Cause Readied"